I decided to make this post to gather all the known, accurate and current information about the C/MS Upgrade for the 2.0. This post supersedes anything I have said in prior blog posts. As you should know, Creative Labs' first PC sound card of any note was the Creative Music System card (C/MS), later re-marketed as the Creative Game Blaster. 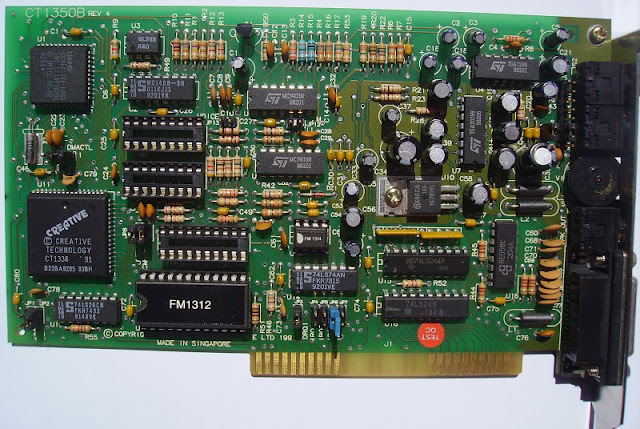 This card was based off two sound chips CL labeled as CMS-301, but were actually Phillips SAA-1099s. The C/MS card was not a great seller, and even the name change failed to dislodge the Ad Lib card from its increasingly dominant position in the affordable PC sound card market. Thus Creative came up with the "killer card", the Sound Blaster. This card combined the full functionality of the Ad Lib card with almost all of the functionality (detection chip was eliminated) of the Game Blaster card and more. 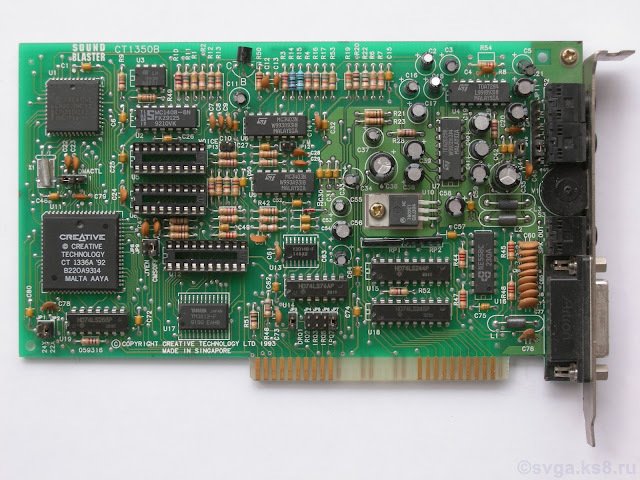 While the Sound Blaster, with its joystick/midi port and digital sound processor began to sell well, the design was definitely in the past with lots of TTL logic chips. The card was originally marketed as a "stereo" card, but the only thing stereo about it was the Game Blaster chips. 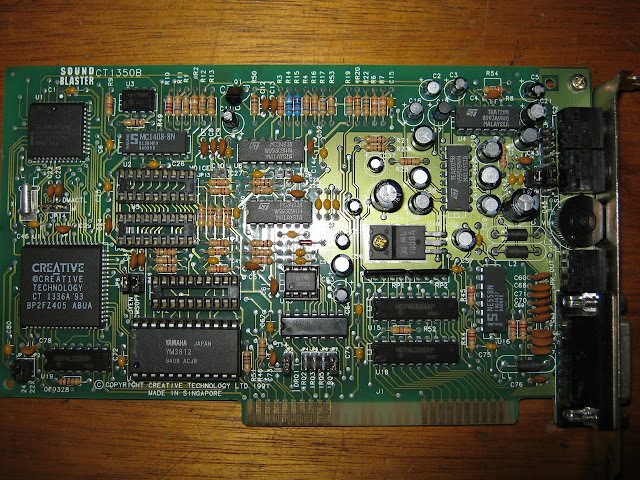 In the first production runs, the two Game Blaster chips, marked with a CMS-301 sticker were soldered onto the motherboard (so were the Ad Lib chips, marked FM1312 and FM1314). 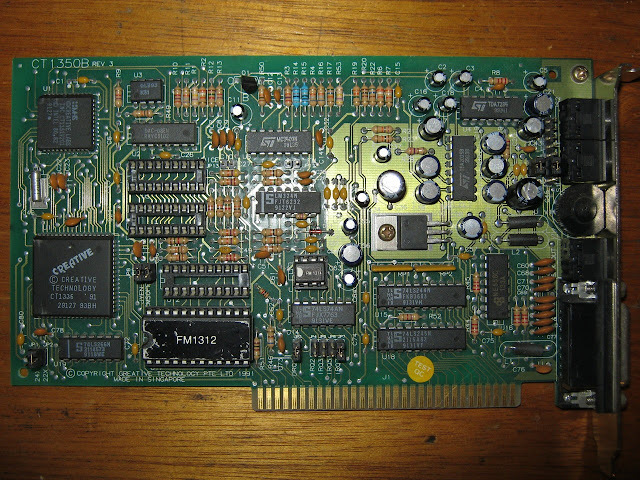 However, almost nobody really cared about Game Blaster when the Adlib was also present, and virtually all games that supported the Game Blaster also supported the Adlib, so for the 1.5 version of the Sound Blaster, the chips were not installed by default. The two empty sockets could be populated with chips purchased from Creative Labs fr the low, low price of $29.95. After CL released its new flagship product, the Sound Blaster Pro, it redesigned the original Sound Blaster as a budget card and released it in late 1991. CL enhanced the new card's capabilities by allowing it to record up to 44.1kHz, but it was still a mono card. The C/MS chips were left off the board again, but this time there was a third empty socket. A special version of the upgrade was required from CL, one not really well-identified in the catalog accompanying the card. The third chip had a sticker marking it as 0048013500, and underneath it was a pre-programmed PAL (Programmable Array Logic) chip. (A PAL16L8 chip with the security fuse blown so it could not be dumped). Eventually, CL stopped advertising the upgrade completely, and without the PAL chip the CMS functionality would not work even with the Phillips chips were installed. Given the rarity of boards with the upgrade found in the wild and the lack of advertising, few upgrade kits must have been sold. However, in 2012, a long-time member of the Vintage Computer Forum named Chuck(G) devised a method to determine the way in which common PALs were programmed. 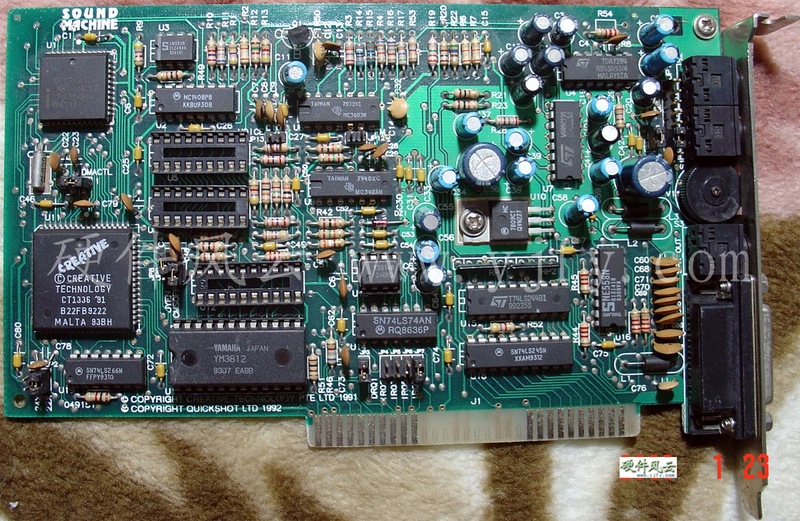 He analyzed the PAL on an officially upgraded Sound Blaster 2.0 and released the instructions to replicate the programmed logic on a GAL (Generic Array Logic) chip. Unlike PALs, GALs can be reprogrammed and do not require expensive and hard to obtain hardware to program. The GAL required is a GAL16V8 and the file to program the chip can be found here : http://www.vintage-computer.com/vcforum/entry.php?328-Cloning-a-HAL-PAL-Part-11. The programmed chip is inserted in the only empty socket that can fit it, the one just above the FM1312 /YM-3812 chip. However, in almost one year following the first successful report of a GAL SB 2.0 CMS upgrade, not all boards have worked with the upgrade. Below I try to identify each board known whether or not to work with the upgrade. Between the rev 2 and 3 and the rev 4 and later boards, there is one obvious difference. The rev 4 added a DMACTL jumper. 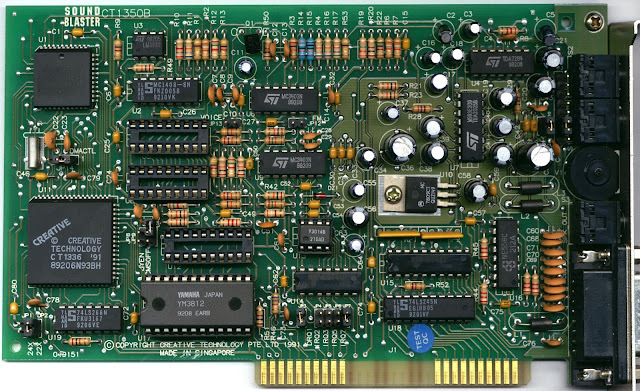 This jumper will disable the DMA capabilities of the Sound Blaster, virtually eliminating its ability to reproduce digitized sound. However, and it may not be truly visible in the photo, but both share a CT1336 Bus Interface Chip and a CT1351 DSP chip, version v2.01. You can identify the DSP chip by this silkscreened text on the chip "CT1351V201", with the "V201" indicating the version number. These boards have been proven time and time again to work with the CMS upgrade, whether a GAL or PAL. Apparently there is no difference between Lattice Semiconductor and National Semiconductor GALs. Apparently SGS Thompson GALs do not work. The first is a 049151 with a v2.02DSP and a CT1336 chip, the second one is identical except for the word "SOUND MACHINE". After further testing, it has been determined that that the DSP version does not matter, the CT1336 version does. If your card has a v2.01 DSP or v2.02 DSP, the upgrade will work. 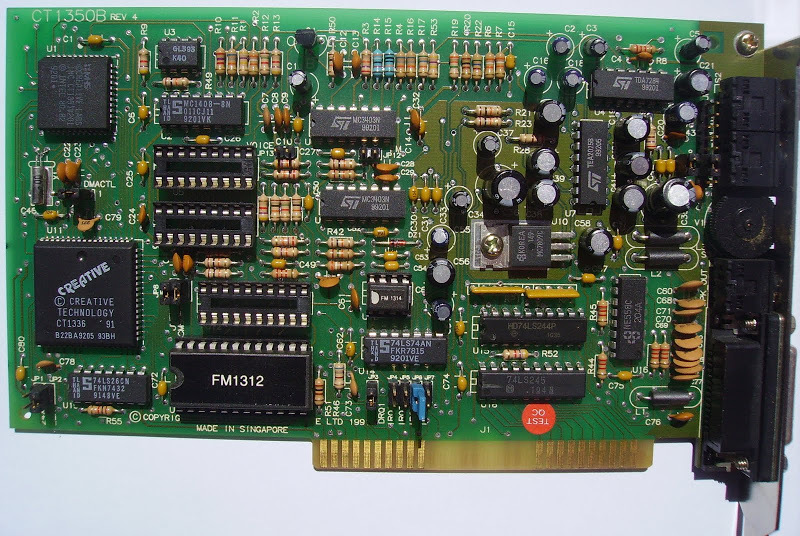 If your card has a CT1336 Bus Interface Chip, the upgrade will work. On the other hand, if your card has a CT1336A Bus Interface Chip, the upgrade will not work! Since v2.02 DSPs tend to be paired with CT1336A chips, be very careful to check the bus interface chip before you buy. Make sure your seller shows you a photo of the exact card you will receive. I look forward to your posts, always so much good information. I have two CT1350B cards with CT1336A Bus Interface Chips (Rev. 05 and 06 Boards). My selfmade CMS Upgrade (with a Lattice GAL16V8B-25LP) works well on these two boards. I compared it with my CT1320C - the sound experience is the same. Does anyone know the CT# of the early 1990s Creative CMS upgrade kit? Thanks. As a courtesy to vintage / classic / retro gamers / sound card collectors / enthusiasts I have listed the combination of the GAL and Philips chips for $25 per set. Also interesting is that VERY LATE SB2.0 cards have a smaller YM3812 chip named YM3812f. Interesting I have several CT1350's anyone know someone who still supplies the cms upgrade for these? I do not know anyone who is currently offering programmed GALs, but there is no reason why you could not find someone who has a programmer and supply him with the right file and the chip you need programmed. You can find all the information in or linked by the blog post. so whats so great about being able to record at 44.1 via a 3.5mm stereo in jack.. on a 1990 soundblaster ?? if that is the only benefit of the upgrade chip.. when virutally any soundcard u trip over can do this.. other than the fact that this one is older.... i dont understand the real benefit here.. its cool + interesting i suppose but not cool + interesting enough to dwell on for more than a few moments. if it added sound synthesis abilities that would be a different story. 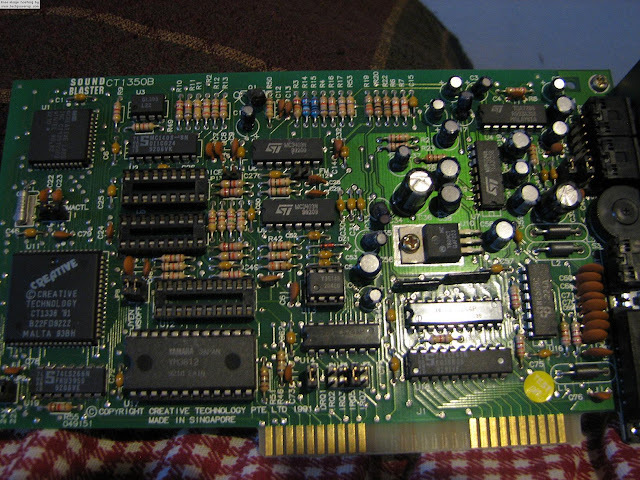 The Sound Blaster 1.0 or 1.5 has a 40-pin DIP (through hole) socketed DSP chip, usually v1.05, However, it can be removed and replaced with a DSP v2.00 chip. The v2.00 DSP chip does not enhance the Sound Blaster's capabilities to an ordinary user in an obvious way, but it does allow programmers to access to the auto-init DMA mode. Auto-init DMA allows the programmer to keep a digital sound buffer full as samples are played, leading to much smoother playback. It is necessary for Windows MPC compatibility, to the extent that matters. 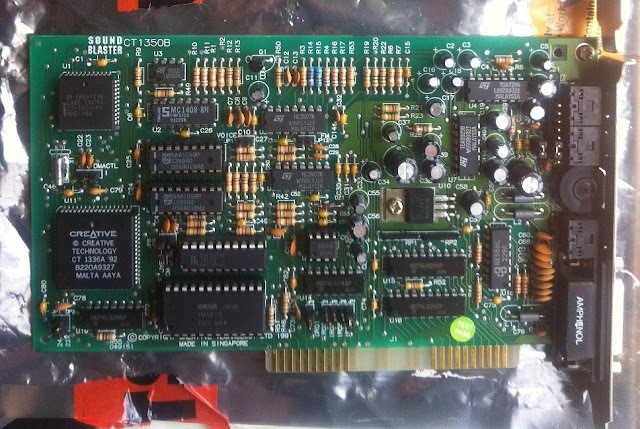 The Sound Blaster 2.0 is not an upgrade chip, it is a major board revision. It has a DSP 2.01 or 2.02 PLCC (surface mounted) chip which is always soldered onto the board. When it was released as a budget board the older Sound Blaster 1.5 was discontinued. The DSP v2.01 adds the 8-bit/44.1KHz mono playback, which may not seem very impressive today, in 1991 it was far more impressive then for a budget board then and even today there are DOS games that will output digital audio with better clarity due to the higher sample rate. This is really cool! Thanks for posting this, came up with this in a search, and realized I've seen many of your other blog posts before. Actually, the new C/MS upgrade GAL, which is compatible with all CT1350B revisions, was NOT reverse-engineered from an existing PAL device, but I developed it from scratch. The original Creative's PAL equations are probably the most buggy code I've ever seen in my whole life. I note the distinction, and if it works for all cards as it appears to do now, then that is a great benefit to the community.